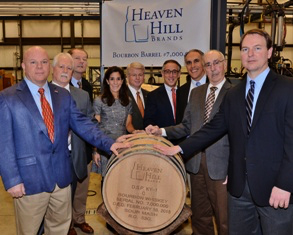 February 10, 2015 – Heaven Hill Brands marked two milestones at a ceremony today in Bardstown, Kentucky: the company’s 80th anniversary and the filling of its seven millionth Bourbon barrel. The celebration comes just 23 months after the filling of barrel number 6,500,000 — meaning that Heaven Hill is laying down approximately 250,000 barrels of whiskey each year. Master Distiller Emeritus Parker Beam joined Co-Master Distiller Denny Potter and Artisanal Distiller Charlie Downs to “bung off” the ceremonial cask along with members of the Shapira family, which founded Heaven Hill in 1935 shortly after the end of Prohibition. In a news release, Heaven Hill President Max Shapira called the dual celebration a momentous achievement for the company. The ceremonial cask was signed by Heaven Hill employees and will be placed alongside previous milestone barrels in Rickhouse Y at the company’s Bardstown campus. The rickhouse is part of the tour for visitors to Heaven Hill’s Bourbon Heritage Center.